Hastingleigh village is a household word for miles around. It is still the only local shop and can supply most of the everyday necessities. From George Tappenden senior it passed about 85 years ago to his sons CF Tappenden [Cubison Tappenden] and EG Tappenden [Edward Tappenden]. be bought for 2s a pair and for children the price was 1s. butter was 1s, and lard 4d. For 2s3d a villager could buy eight pounds of best streaky pork and 1 1/2 pounds of beef, prime cut was 10 1/2 d.
Sugar was 2 1/2 d per pound: coal was 1s 6d cwt. their son and daughter-in-law Capt. and Mrs Peter Tappenden and another relative Miss Lowden. or 14 hour day, when he was the stores delivery man, using a horse and cart to cover miles of lonely country roads in all weathers. 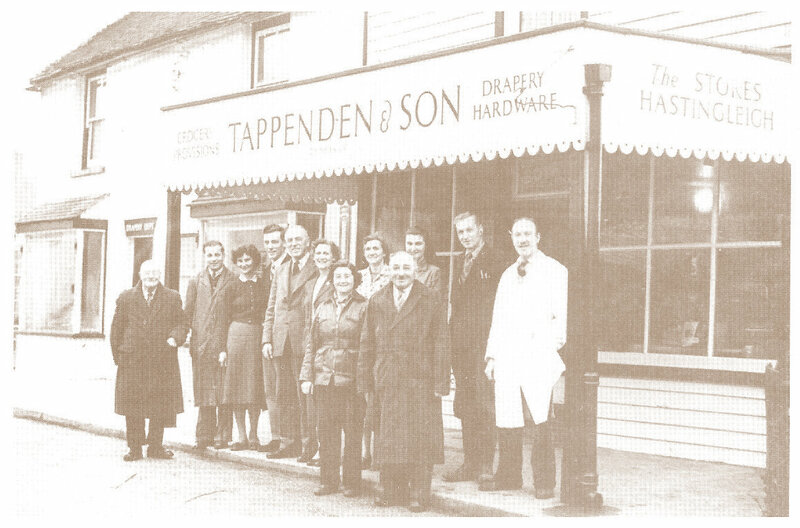 still helps in the Tappenden household; one daughter Miss Eileen Bartlett delivers goods by van and another Mrs Cooper, works in the office and drapery department. Her husband is the stores roundsman. Also at the dinner were the other employees; Mr and Mrs Thompson and Mr V Wraight. After roast turkey and port, Mr Tappenden thanked the staff for their loyalty and joined them in drinking a toast to the good old firm. in addition has a sub-Post Office and a Savings Bank. For nearly three quarters of a century the Stores has been a local agent for the Kentish Express. on managing the store and business interests, until it was sold and she retired. Store Changes Hands - after 108 years. 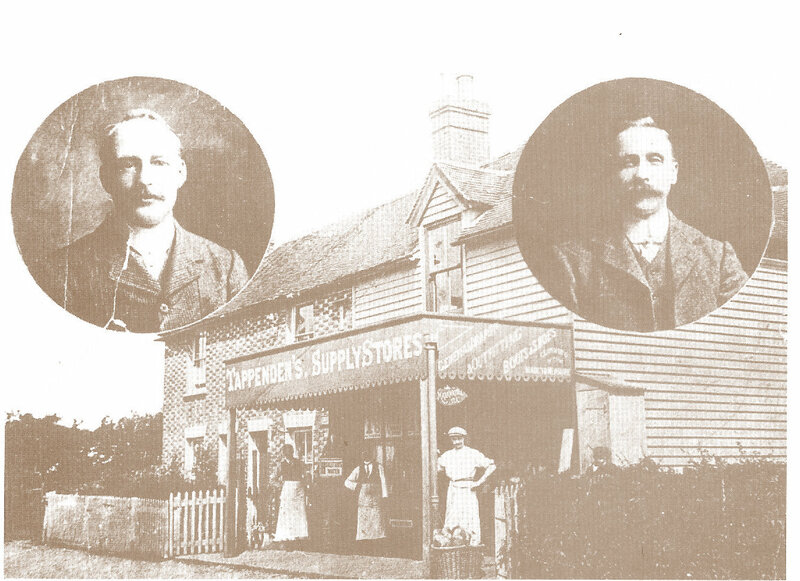 of one generation of Tappendens, Edward (left) and Cubison (right), who have owned the business since it began in 1857.
the Post Office was through the shop in to the Bakery. When the Bakery changed to a house, the PO occupied a small corner of the store behind safety glass. knew everyone else, and the village shop really was the hub of village life and a lifeline to many. the robbers having made their getaway through Elmsted to Stone Street. The Post Office closed in 199? and the opening of super stores in nearby Ashford signalled the death knell of Hastingleighs famous store. residence having at one time contained the Post Office. The red post box is still in situ, adjacent to the shop front. site to some useful purpose, keeping the familiar facade intact, as it has been for over a century. 2015 update: the premises have been converted to residential use in the years since this page was written. Visit the Gallery for several views of the Stores over the years (click to view).